Make your own iPhone ringtones from your favored music or videos with the 4Media iPhone Ringtone Maker for Mac. This iPhone Ringtone converter can convert nearly all the video and audio formats including AVI, MPEG, WMV, DivX, MP4, H.264/AVC, AVCHD, MKV, MP3, WMA, WAV, M4A to M4R files and automatically uploads them to your iPhone. Compatible with iPhone XS, iPhone XS Max, iPhone XR, iOS 12 and iTunes 12 now. Integrated with the functions of iPhone Ringtone Converter, Creator, and Uploader, the 4Media iPhone Ringtone Maker for Mac is the ultimate tool for creating the perfect ringtones. Convert to M4R format from all the popular video and audio formats such as: AVI, MPEG, WMV, DivX, MP4, H.264/AVC, AVCHD, MKV, RM, MOV, XviD, 3GP, MP3, WMA, WAV, RA, M4A, etc. You can directly upload the ringtones to your iPhone after conversion. Create an iPhone ringtone of your own! The iPhone Ringtone converter lets your trim any music segment you want, listen to the segment, add fade-in and fade-out effects, then convert the segment into an iPhone ringtone! With just a few clicks, you can convert any video and music into the iPhone compatible M4R file. 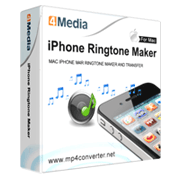 4Media iPhone Ringtone Maker is absolutely the easiest way to make iPhone ringtones! This Mac iPhone ringtone maker support all iPhone/iPad types: iPhone, iPhone 3G, iPhone 3GS, iPhone 4, New iPad, iPad mini and iPad Air, thus allow you to transfer the converted ringtone to any iPhone. iPhone Firmware 3.2.2 and iTunes 10 are now supported. Any music can be converted to M4R format as an iPhone ringtone with this Mac iPhone ringtone converter. Support most audio formats: MP3, WMA, WAV, RA, M4A, AAC, AC3, OGG, etc. This Mac iPhone ringtone making software allows you to make iPhone ringtones from any video formats like AVI, MPEG, WMV, DivX, MP4, H.264/AVC, AVCHD, MKV, RM, MOV, XviD, 3GP, etc. The iPhone ringtone maker for Mac can help you upload the converted M4R file to iPhone directly after making the iPhone ringtone. Designate ringtones to your contacts, and know who is calling by the ringtone. You can now add fade-in and fade-out effects to your iPhone ringtone with this 4Media iPhone Ringtone Maker for Mac, making the ringtone personalized. Have a favorite segment of a song? Then simply select the segment of the song you want and convert it to an iPhone ringtone. Make sure the audio segment is exactly what you wanted by playing the audio with the built-in music player before making iPhone ringtone on Mac. Drag and drop to add files to be converted into iPhone ringtones; adjust the ringtone volume to make it fit your taste; and name the ringtone at will. This iPhone ringtone converter for Mac owns so terse interface and so sound design that you can make iPhone ringtone in just two steps: add a file and then convert it. 4Media iPhone Ringtone Maker for Mac offers English, German, Japanese, French and Chinese interface languages. Output Devices Supported iPad, iPad 2, iPad 3, iPad 4, iPad mini, iPad mini 2, iPad mini 3, iPad mini 4, iPad Air, iPad Air 2, iPad Pro (12.9/9.7/10.5 inch), iPod, nano (5th Gen), iPod mini, iPod shuffle, iPod classic, iPod touch, iPod touch 4, iPod touch 5, iPod touch 6, iPhone, iPhone 3G/3GS, iPhone 4, iPhone 5/5S/5C/SE, iPhone 6/6 Plus, iPhone 6S/6S Plus, iPhone 7/7 Plus, iPhone 8/8 Plus, iPhone X, iPhone XS, iPhone XS Max, iPhone XR. Now fully supports iOS 4.1, iPhone Firmware 3.2.2 and iTunes 10. Makes ringtone more precisely with the time set to millisecond. Supports fade-in and fade-out effect of ringtone. Added the function of adjusting ringtone volume. Supports to name the ringtone freely.